As part of the recent launch of Hillary Clinton’s campaign for the presidency, her team introduced a new logo that drew as much highly-opinionated chatter in the design community as did her candidacy in the political arena. However, I will argue about three undeniably psychological messages—one positive and two negative—that the new logo conveys to viewers (i.e., voters). (-) The arrow is red which is associated with both danger and the Republican Party. (+) The arrow points to the right and some of the designers commented that this sends a subliminal message of right wing politics (the reverse of Ms. Clinton’s famous 1998 statement that “a vast right wing conspiracy” was targeting her husband). However, I submit that the arrow sends a positive message for the simple reason that we Americans read from left to right. Consider—and feel—how the left-to-right arrows in the ubiquitous FedEx and Amazon logos express forward propulsion. A one-in-three average makes for an all-star baseball batter but, in the highly-competitive arena of presidential politics, Ms. Clinton needs to up her design game. 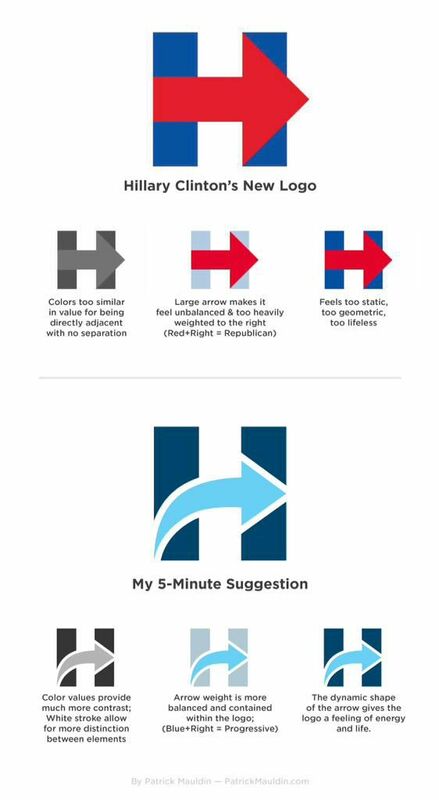 She might consider revising her logo with the “5-Minute Suggestion” from Texas graphic artist Patrick Mauldin, who changed the color of the arrow to Democratic Party blue and gave it a dynamic left-to-right rising swoosh. In politics, as in any form of communication, every little detail counts. 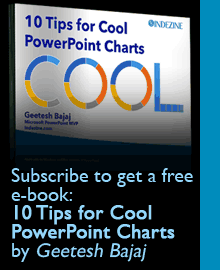 This blog post by Jerry Weissman was first published on his site at Forbes. He has written five books on presentation skills. His most recent, Winning Strategies for Power Presentations, published by Pearson, is available now from Amazon. Jerry Weissman is among the world’s foremost corporate presentations coaches. His private client list reads like a who’s who of the world’s best companies, including the top brass at Yahoo!, Intuit, Cisco, Microsoft, Netflix, RingCentral, Mobileye, OnDeck, CyberArk and many others. Jerry founded Power Presentations, Ltd. in 1988. One of his earliest efforts was the Cisco IPO road show. Following its successful launch, Don Valentine, of Sequoia Capital, and then chairman of Cisco’s Board of Directors, attributed “at least two to three dollars” of the offering price to Jerry’s coaching. That endorsement led to more than 600 other IPO road show presentations that have raised hundreds of billions of dollars in the stock market.